It's Hump Day, and today's theme is apparently things that make us happy. Until yesterday, when Miss 8 talked me into buying a six-pack of Hot Choc Buns from Brumby's. They're running a special deal where you get a free sandwich loaf or six bread rolls free with every half dozen, which appealed to the bargain hunter in me. "Are you sure you will eat them?" I asked Missy Moo. "Because you know I don't like them." Yes, she said, she would, bouncing around happily like a little energiser bunny in anticipation. Non-bread-eating Mr 10 is packing away jam sandwiches like no tomorrow since his recent surgery - they were the first food he kept down after his op, and I think have become like instant comfort food. So we chose the free sandwich loaf together with a six pack of the double chocolate buns. When Miss 8 tore into the buns for afternoon tea, they smelled divine. I pinched just a tiny piece off from one of them, just to taste you understand. I almost melted in pleasure. I tried a little bit more - just to make sure I wasn't mistaken, of course. And a little bit more. Before I knew it, the bun was gone! This morning, under the guidance of Herself, we heated the buns lightly so the chocolate got gooey and melty. We were both in chocolately ecstasy. I think the secret is that the chocolate is Cadbury, which is my favourite everyday chocolate, and which is moist and rich without being too sweet. Hot Choc Buns aren't very Boombah-friendly, but this morning I did not care. Miss 8 is lucky, as she can indulge in them whenever she likes. And apparently there are raspberry choc and orange choc ones as well. Readers, what's your guilty pleasure? Oh dear, I didn't know about the rasp choc or orange choc ones. Must remember to stay away from Brumbys, I'll be too tempted not to say no. 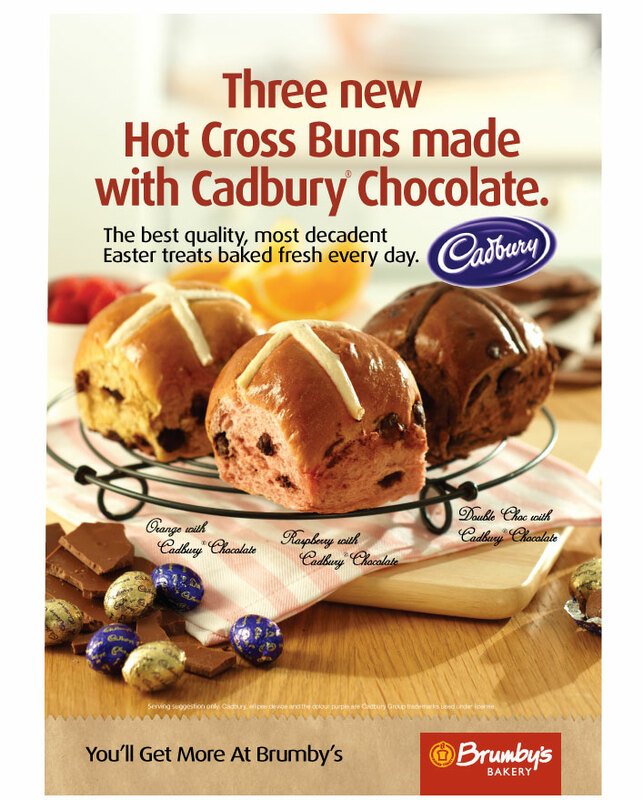 Usually I ake my own hot cross buns last year I didnt but will be this year. Happy to hear you found some buns you can now eat. Oh I always pick out the sultanas as well ... and it kind of takes the pleasure out of it. It'd be great to hear what you and your readers think of the other flavours once you try them.